Belinda Stronach, Chairman & President of The Stronach Group, has tapped entertainment and hospitality vet Jimmy Vargas to lead the company’s newly created entertainment division. As part of The Stronach Group’s mission to modernize the sport of Thoroughbred horse racing by exciting and energizing the next generation of fans, Vargas will curate unique and engaging experiences across all of The Stronach Group facilities. From concerts and festivals to digital innovations, the focus on entertainment and guest experience is a key driver to The Stronach Group’s business. Since joining The Stronach Group in the spring of 2018, Vargas has produced the InfieldFest featuring Post Malone, Odesza, 21 Savage and Frank Walker at the legendary Preakness Stakes at Pimlico Race Course in Baltimore, Maryland, as well as the inaugural Clubhouse Festival featuring Steve Aoki & Tyga at the 33rd Jim McKay Maryland Million at Laurel Park Racetrack. Vargas’ current focus is on delivering an incredible entertainment experience at the 3rd annual Pegasus World Cup Invitational taking place on January 26th at Gulfstream Park, The Stronach Group’s facility located just north of Miami. Jimmy Vargas is one of the entertainment industry’s top talents, with 20 years of experience in the experiential, communications, broadcast, digital and marketing arenas. 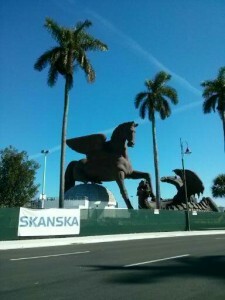 Prior to joining The Stronach Group, Vargas was Vice President of Sales & Marketing for Miami, FL-based powerhouse MMG Entertainment & Hospitality, where he was the driving force behind some of the most successful and world-renowned brands; LIV at the Fontainebleau, LIV at Hard Rock Stadium, Story, Komodo, Komodo Lounge and OTL. In this role, Vargas oversaw all entertainment marketing initiatives for the venues, including: event and talent booking, promotions, content creation, sales, production and brand partnerships. Working beside the company’s CEO since its inception, Vargas was responsible for growing the company from one venue in year one at $18M in gross revenue, to a complete and diversified hospitality portfolio of six venues with gross revenues exceeding $85M annually. Among the hundreds of special events Vargas oversaw from conception to completion were the annual Fontainebleau Miami New Year’s Eve events featuring A-list talents including; Lady Gaga, Justin Bieber, Drake and The Weeknd. Vargas also collaborated on national broadcast partnerships for events such as the BET Hip Hop Awards, Victoria’s Secret Fashion Show for CBS Broadcast and LIV pop-up series at major EDM Festivals including TomorrowWorld, Electric Zoo and Sunset Music Festival. Upon execution of the AXE Lounge Partnership for Super Bowl XLIV with Jennifer Lopez, Vargas was invited to recreate the event the following year for the Super Bowl in Dallas. Prior to MMG, Vargas was a Partner in Gorillas Lifestyle Marketing (overseeing strategic experiential marketing efforts for MOCA, Lexus, Pepsi and Microsoft); Creative Marketing Director for the Opium Group Nightlife & Hospitality (one of South Florida’s most successful hospitality groups); and helped to launch Gen Art Miami (the nation’s leading arts and entertainment organization in support of emerging talent in fashion, film, music and the visual arts). Vargas holds a dual degree in Telecommunications and Marketing from the University of Florida. He lives in Miami, Florida with his wife and two sons.